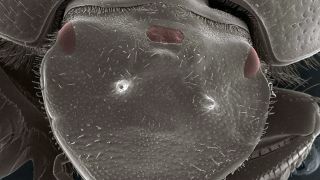 Biologists at Indiana University have created a beetle with a functional extra eye, in the hope of studying the genetic building blocks that define how the insect head develops. The research, which was published in the Proceedings of the National Academy of Sciences, built on previous experiments that accidentally produced an extra eye. Or technically, the "fusion" of two sets of additional eyes. To create the three-eyed beetle, the scientists used a simple genetic tool to deactivate a single gene in the insect's genome. Previous research had shown the gene plays a role in telling the head how to form. "This study experimentally disrupts the function of a single, major gene," said Armin P. Moczek, a professor in the IU Bloomington College of Arts and Sciences' Department of Biology. "And, in response to this disruption, the remainder of head development reorganises itself to produce a highly complex trait in a new place: a compound eye in the middle of the head." In tests of the third eye, the team found that it had the same cell types, the same nerve connections and made the beetle respond in the same ways as the two other normal eyes. "Developmental biology is beautifully complex in part because there's no single gene for an eye, a brain, a butterfly's wing or a turtle's shell," said Moczek. "Instead, thousands of individual genes and dozens of developmental processes come together to enable the formation of each of these traits." Eduardo E. Zattara, lead author on the study, added: "The use of ectopic eyes is a highly accessible paradigm to study all of this, across many types of organisms. We regard this study as really opening the door to new avenues of investigation in multiple disciplines."